Is mistletoe a killer? Or is it just the last thing to see the tree alive? Now we’re at the tail-end of the mistletoe season, with seed-planting almost over, I’ve been having a look at several sites where mistletoe-laden trees are dying. And getting asked “is mistletoe the killer?”. It isn’t, of course, as it needs its host to be alive. But it can cause host death, inadvertently, if there’s too much of it relative to the host. So it’s not a killer, but it can cause death. I hope that’s cleared things up. How can it cause death? Well, direct effects are two-fold – a total takeover of the branch it is on – not a problem when it’s only on a few branches of many, but a bit of an issue if it’s on most branches. And general water stress – mistletoe draws water preferentially, so is effectively stealing water from the tree’s own leaves in summer, plus it’s forcing the tree to continue transpiring all winter, when it (the host) should be dormant. 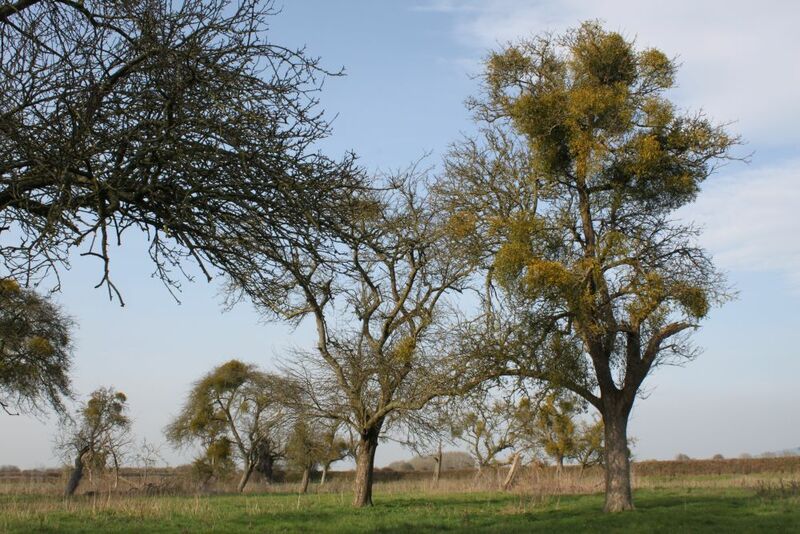 Indirect effects can be major too – but only with significant infection, and then largely due to increased windage – which is why so many over-mistletoe-laden apple trees blow over in storms. Management is the key to sorting this out of course, and this is easy in a garden situation – pruning excess mistletoe every now and then. But it is often, increasingly often, overlooked – and this is where I should mention the mistletoe management survey project – the Mistletoe League – that is currently gathering information on mistletoe in gardens and orchards. Details are here. A recent article in the Eastern Daily Press tries, and largely fails, to cover the same killer question. A reader has asked could mistletoe kill her rowan, and Martyn Davey, Head Of Horticulture And Design, Easton College replies that no it won’t. But it might Martyn, it might. It’s a pity he didn’t put in some management information that could have been helpful to the questioner, a Mrs G Smith of Swardeston. Instead he makes do with some generalities and then launches into an account of how to grow it – which he’s cut and pasted from the RHS website. Their advice is, as I’ve pointed out on here before, entirely wrong, so that’s not very useful to readers of the EDP either. I’m hoping to get the RHS advice updated for next season, possibly via their Garden magazine (which did run with sensible advice on this a couple of years back, but they never updated their online site). The key needs are to NOT cut flaps in the bark, NOT cover with hessian etc. The seeds need to be in the light, on the outside of healthy bark, and have room to grow. The advice RHS, and EDP via Martyn Davey’s recent piece, give is exactly wrong… For more considered advice, try here. Is it Psylly season already? Recently I’ve been spending rather too much time examining mistletoe berries – they’re more interesting than you might think (no really, they are…). And noticing a lot of insect activity, especially where there are groups of 3 or more berries – which fit together to create lots of complex little niches to shelter in. 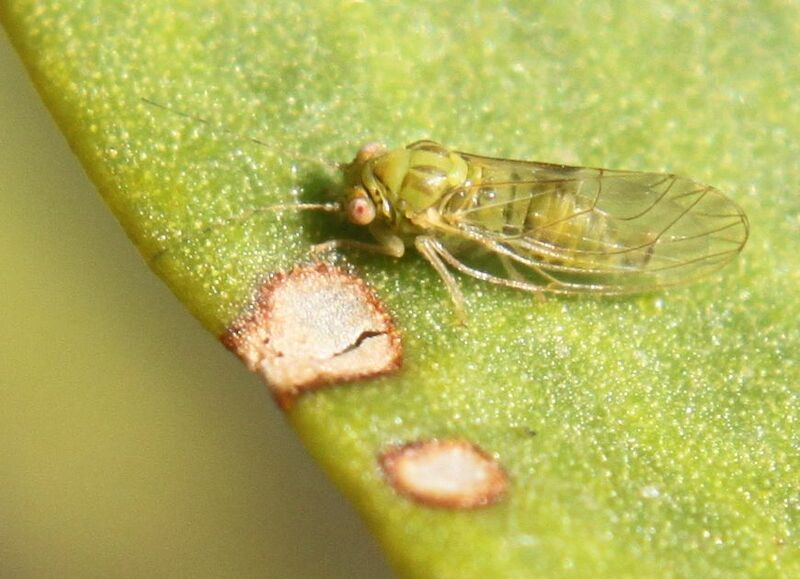 In late February many of these berry groups were infested with small instars of some bug or other – difficult to say what, but they got bigger as the weeks went by. 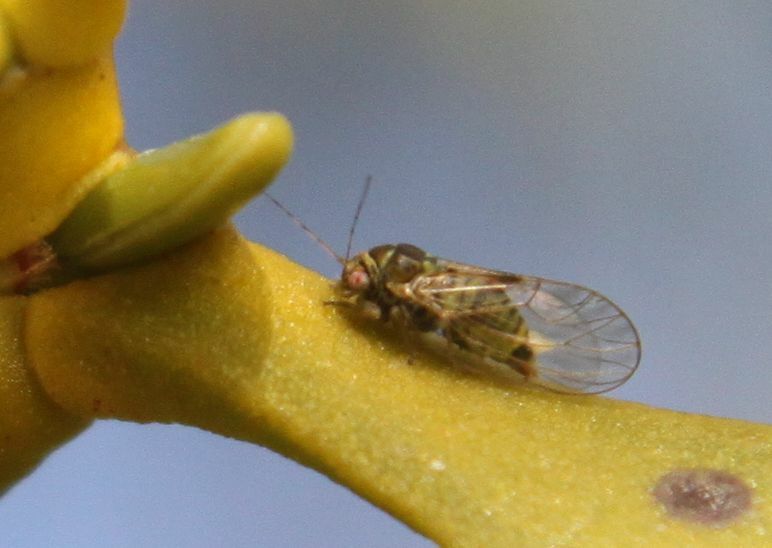 Now, I’m no bug expert, but they were beginning to look like psyllids to me – and so were possibly Psylla visci (more properly Cacopsylla visci these days), the mistletoe plant louse. But Psylla visci is, according to the texts, not supposed to be around as an adult until the summer. And these beasties were getting v close to final instar/adult size. So, I wasn’t surprised to find some adults yesterday (20th March), on mistletoe on a large Poplar on the banks of the Severn at Longney, Gloucestershire.